Art was born in Sweden in 1948 and immigrated to the United States as a child. During high school, Art began taking comics seriously and started to pursue a career as a comics artist. He worked for several underground comic magazines and published under various pseudonyms. It was with his publication of Maus that Art came to true fame. The story originally published in Funny Animals in 1972. Maus is a graphic novel that tells the story of Art's parents and their struggle throughout the Holocaust. 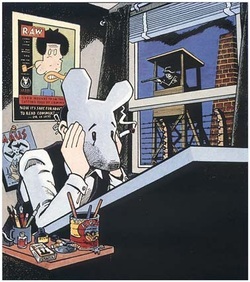 Spiegelman uses animals to represent the characters in the novel. He reveals a story of survival while touching on the nature of familial relationships when tragedy strikes on multiple levels.